Beat the softened cream cheese in a large mixing bowl until smooth and lump-free. Next, add the egg yolks and whisk in until smooth. Repeat with sugar and lemon juice, making sure batter is completely smooth before adding the next ingredient. Sift over the flour, then whisk through gently until smooth. Pour in milk and whisk gently until smooth. In a separate clean bowl, add egg whites. Whisk or beat until stiff peaks form. Using a rubber spatula, add a spatula worth of egg white and beat into the cheesecake mixture to loosen. Next, gently fold in one third of remaining egg white, making sure not to deflate egg whites. Some egg white streaks are okay. Repeat with remaining egg white. Grease rice cooker bowl well with butter. Pour in the cheesecake mixture, then cook using the white rice setting, or according to the manufacturer’s instructions for your rice cooker. When fully cooked, the cake should pull away from the sides and spring back when touched. If undercooked, cook again until done. Once cooked, remove bowl from rice cooker and allow to cool for 10-15 mins. 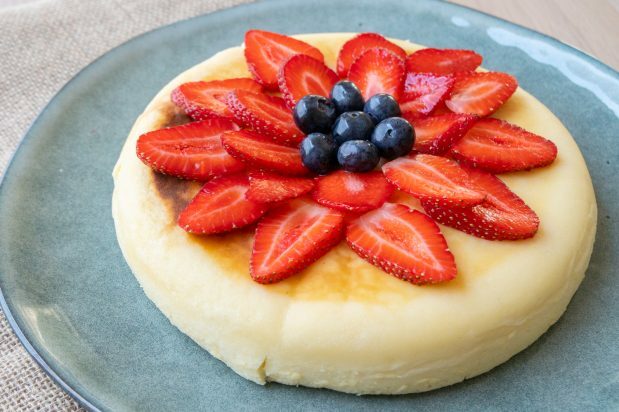 Carefully remove cheesecake by inverting onto a plate. Allow to cool completely before garnishing with berries and serving.